Did you try the orange blossom and rose water? They often occurs in the, among others, Lebanese and North African kitchen. With its intense flavors they have to be used with care but once used to it… Oh my, a poetic flower bomb is opening up! Today I open the bottles to the magical orange blossom water and rose water. Are you joining me? What is orange blossom water and rose water made of? Orange blossom water is (or at least should be) produced by orange flowers and water. See that you get the real thing without any synthetic additives, the price is as always an indication of quality…. However the essence is very aromatic and a true flower bomb. It has been used as aromatizer in many Mediterranean traditional dessert dishes in France, Spain, Greece and Cyprus. But also as a traditional ingredient often used in the North African as well as in Middle Eastern kitchen in dishes like the well-known and super-sweet baklava. Rose water is produced the same way as the orange blossom water. Also this one is enormously intense in aroma and taste. In Iran, it is added to tea, ice cream, cookies and other sweets. In the Arab world, Pakistan and India it is used to flavour milk and dairy-based dishes such as rice pudding. It is also a key ingredient in sweet lassi, a drink made from yogurt, sugar and various fruit juices. The smell when you open a bottle of any of the waters are intense! Obviously, the orange blossom taste like oranges… With an intense, warm taste they immediately bring in the sun to your mouth. Delicate and complex. Closing your eyes, you easily can imagine standing clooooose to flowering rose bushes a warm, sunny day when adding rose water to your dish. Although not sweetened, it adds a sweet taste to almost any dish. Due to their intense taste, it is important to keep in mind the amounts used. A little too much and your dish will turn into a overwhelming something ready to go straight into the green bin. But then again, when handle with care the sweetest love stories can be achieved and new taste inventions be found! How do I use orange blossom water and rose water? Orange blossom water is lovely to combine with strawberries and apricots. Just add a few drips to the next cake your making or maybe to your nice-cream (frozen bananas mixed with some almond butter and vanilla). Part from using it in sweet dishes, you can also combine in savory dishes. One easy way to add some exotic taste to your food is to add a few drips in your salad dressings for an extra touch. Just mix olive oil, balsamico, salt and pepper and a few drips of the orange blossom water. Spread it on top of green salad or just cucumbers. Yum! Add the rose water to a fresh fruit salad. Strawberries, melon and peach al works very well with the taste of roses. If you prefer it less intense, you can even just add it to the sides of the bowl with a bit of kitchen towel and a few drips of the rose water. It will just give a subtile fragrance to it. Adding a few drips to a yoghurt or cashew cream can also be a nice addition to a cake. Orange blossom water and rose water can be bought in well-stocked supermarkets and stores with food from the Middle East. 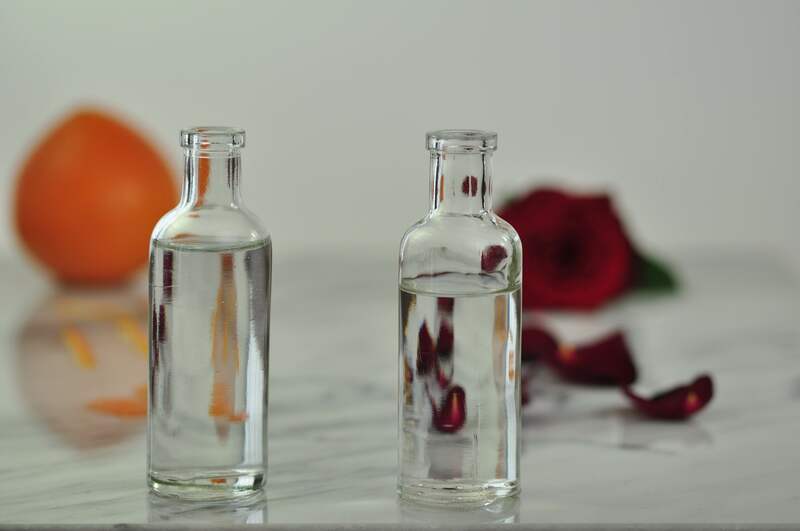 Since it is precisely the special flavor of orange blossom water or rose water, you are looking for in the recipe, there is no direct replacement. Just skip it if you can’t manage to find it. Orange blossom and rose water must be the perfect accompaniment for dishes made in the summer. I promise you, more recipes will be posted within short with these flowery beauties!